Born in Moscow in 1895, Léonide Massine received his ballet training at the renowned Imperial Theatre School. While he performed in character roles in ballets at the Bolshoi Theatre, he simultaneously was developing a passion for acting and appeared in plays at the Maly Theatre. He considered a career as an actor but in 1913 Serge Diaghilev saw him dance. As Diaghilev was seeking to replace Nijinsky, he invited Massine to join the Ballets Russes. 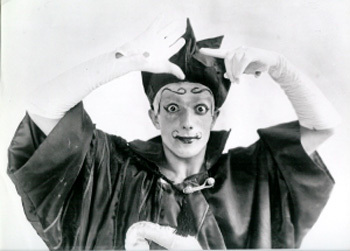 After performing the role of Joseph in Fokine's "Legend of Joseph" in Paris in 1914 and choreographing his first work ["Soleil de Nuit"] a year later, he became a principal dancer and choreographer of the Ballets Russes. In 1917, in collaboration with Erik Satie, Pablo Picasso and Jean Cocteau, he created "Parade" a seminal work imbued with Cubist and Futurist ideas that would establish his prominence as a modern choreographer [and that of Picasso as an avant - garde set designer]. In "Parade", the joining of music, décor, costumes and choreography expresses a form of fantastical realism. Apollinaire's enthusiastic attribution of the term "sur-realism" to the work emphasized "Parade's" significance to modern and future art movements-Dadaism, Surrealism and its foreshadowing of Pop Art. Massine embraced Diaghilev's pioneering vision of a synthesis in the arts, choreographing numerous works with major artists and composers of the time, including Pablo Picasso, Henri Matisse, Georges Braque, Andre Derain, Leon Bakst, Natalia Gontcharova, Michel Larionov, Robert and Sonia Delaunay, Manuel de Falla, Erik Satie, Igor Stravinsky and Sergei Prokovief, to name but a few. Between 1917 and 1920, during the chaos and aftermath of World War I, these extraordinary collaborations with leading artists of the twentieth century produced a series of groundbreaking works that propelled dance into the realm of modernity: "The Good Humoured Ladies" [Scarlatti-Tommasini/Bakst, 1917], "La Boutique Fantasque" [Rossini-Respighi/Derain,1919], "Le Tricorne" [de Falla/Picasso, 1919], "Pulcinella" [Stravinsky/Picasso, 1920] and "Le Sacre du Printemps" [Stravinsky/Roerich, 1920]. In many of these works, Massine was the electrifying lead dancer. In 1920 Massine left the Ballets Russes. Following the urge to develop creatively on his own, he started a small company in London touring South America where both new works and revivals were a tremendous success. Returning to London the company performed at the Royal Opera House of Covent Garden and toured Britain. In 1923, in a welcome return to working in the theatre, Massine choreographed dances for a play, followed later on by work for Charles Cochran and Noel Coward. In 1924 he joined Etienne de Beaumont's "Soirees de Paris" for which he created, among other works, "Salade" [Milhaud/Braque, 1924], "Mercure" [Satie/Picasso, 1924] and the immensely popular "Le Beau Danube" [Strauss, the Younger/de Beaumont/Guys, 1924]. Accepting Diaghilev's invitation to return to the Ballets Russes, he staged several new works for the company-"Zephire et Flore" [Dukelsky/Braque, 1925], "Les Matelots" [Auric/Pruna, 1925], "Ode" [Nabokov/Tchelichev-Charbonnier, 1928]. In 1928 he again left the Ballets Russes shortly before Diaghilev's death and travelled to the United States to explore creative opportunities. In a challenging transition period, over two years he choreographed one ballet each week at the Roxy Theatre in New York City, periodically returning to Europe to create new works. He staged an acclaimed revival of his "Sacre du Printemps" in Philadelphia and at the Metropolitan Opera in 1930 with Martha Graham dancing the role of the Chosen Maiden. He continued his peripatetic creative life, moving back and forth between two continents until he was invited by the newly founded Ballets Russes de Monte Carlo to choreograph "Jeux D'Enfants" [Bizet/Miro, 1932], his first much lauded venture into visualizing music. The Ballets Russes de Monte Carlo, through the vitality and variety of its repertoire and the appeal of its brilliant young dancers, engendered a new Ballets Russes era, fostering an enthusiastic appreciation of ballet [until then the privilege of an elite] amongst a vast international audience. At the creative helm of the Ballets Russes de Monte Carlo, Massine pursued his interest in abstract, symphonic works, leading in 1933 to the creation of "Les Presages". 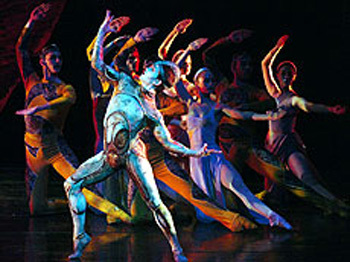 Choreographed to Tchaikovsky´s 5th Symphony, this was the first time in the West that a symphony was used for a ballet. Initially controversial for this very reason, the ballet rapidly became a sensation. In a departure from narrative works, in "Les Presages" Massine visualizes the music in his dynamic use of sculptural groupings and fluid, lyrical adagios. This innovative work would be followed later by other choreographers' use of symphonies for their ballets. Massine continued to elaborate his interpretations of musical structure with a succession of symphonic ballets-"Choreartium" [Brahms/Terechkovitch-Lourie, 1933], "Symphonie Fantastique" [Berlioz/Berard, 1936], "Seventh Symphony" [Beethoven/Berard, 1938], "Noblissima Visione" [Hindemith/Tchelichev, 1938], and finally, "Le Rouge et Le Noir" [Shostakovitch/Matisse, 1939] wherein he achieved the fullest abstraction. His other creations for the Ballets Russes de Monte Carlo include "Scuola di Ballo" [Boccherini-Francaix/de Beaumont, 1933], "Union Pacific" [Nabokov/Sharaff, 1934], "Jardin Public" [Dukelsky/Lurcat, 1936], "Gaiete Parisienne" [Offenbach-Rosenthal/de Beaumont, 1938], "Capriccio Espagnol" [Rimsy Korsakov/Andreu, 1939], "Bacchanale" [Wagner/Dali, 1939], "The New Yorker" [Gershwin Brothers/Irwin, 1940], "Labyrinth" [Schubert/Dali, 1941] and "Saratoga" [Weinberger/Smith, 1941]. From 1933 to 1939, whether touring the United States, Canada, Mexico, Europe or performing at their home, the Royal Opera House of Covent Garden, the Ballets Russes de Monte Carlo gained tremendous international fame and Massine's career as a dancer and choreographer was at its pinnacle. Following the outbreak of World War II, the company left for the United States where for three years they toured the country in grueling one-night stands, performing Massine repertory favorites that then had become a rage with audiences, along with several of his new works. At this stage of his creative life, Massine's primary interest lay in choreographing to symphonic music. However, changes in the administration of the Ballets Russes de Monte Carlo foreclosed such a possibility. Massine's attempts at creating management sponsored works were dissonant with his creative goals and the ballets did not meet with success. In 1942, Massine and the Ballets Russes de Monte Carlo ended their association and Massine began an extensive international career as a guest choreographer and dancer. He staged works for opera and ballet companies [amongst them, American Ballet Theatre, The Sadler's Wells Ballet, The Royal Danish Ballet,The Cologne State Opera Ballet, The Vienna Opera Ballet, La Scala in Milan, The Paris Opera, the Opera Comique, the Teatro Colon in Buenos Aires, the Teatro Municipal in Rio de Janeiro and Joffrey Ballet] plays, musicals and both choreographed and performed in several films ["The Red Shoes", 1948, "The Tales of Hoffmann, 1951 and "Carosello Napoletano", 1953], the latter film having won the Grand Prix at the Cannes Film Festival of 1955. In 1952, Massine realized a longstanding dream-choreographing Christ's passion as a narration in stylized movement in the spirit of Byzantine mosaics and Italian primitive painting. It was a work that he had originally choreographed in 1916 ["Liturgie"] for Diaghilev's Ballets Russes, but which was never performed. Set to thirteenth century Gregorian chants orchestrated by Valentino Bucchi, "Laudes Evangelii" was performed in European churches [Nantes, 1951; Perugia, 1952] at La Scala in Milan  and hailed as a monumental artistic achievement. The work was also produced for television and aired in Europe and in the United States [April, 1962]. While in the last phase of his life Massine was active in staging revivals, he devoted much of his time to developing and teaching a theory of choreography. Following the structure of musical notation, he crafted a choreographic "score" wherein the harmonic elements of movement were observable. "Seeing" and experimenting with movement in this novel way was the last, exhilarating challenge of his rich creative life.